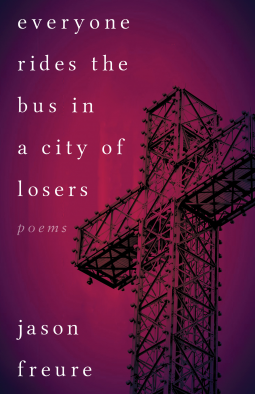 Everyone Rides the Bus in a City of Losers by Jason Freure is a collection of Montreal based poetry. Freure is the editor of The Town Crier blog and operations manager at The Puritan, where he’s worn many hats, including reader, blog columnist, editor, and more since 2013. His work online and in print in magazines like Maisonneuve, CNQ, Vallum, or Carte Blanche, not to mention top-notch little magazines like (parenthetical) and The Hart House Review. Sometime in 1986, Margret Thatcher is said to have uttered these words in public, “A man who, beyond the age of 26, finds himself on a bus can count himself as a failure.” There is no documentation on the quote, but ownership of a car (and other material goods) is tied to successes seems to fit the consumerism politics of the time. This one sentence drives Freire’s work. Here in the Dallas area, our northbound public transportation ends at the city of Allen. Although there are rails running north, the city refuses to left public transit in. The main reason is the crime and poverty that grows along the tracks although it is politically called cost ineffective. There is no doubt the existing train line takes passengers past the back side of buildings and through areas where property values are low. True, also, at central stations it is not difficult to find used needles, homeless, and those sleeping off a drunk. Freure takes the reader on a tour of Montreal with a stop by stop poem. It is not the tour that the city council would approve of, although it is authentic. The collection opens with several poems to set that set the life of an innercity dweller in Montreal. There is a need to keep moving from one depressed area to the next. The line signs on crosses make one wonder if it is a sign of hope — rising from the dead part of the city, or empty cross is waiting for its next. It’s not the destitute or those who gave up in life. Sometimes it is the younger generation who find themselves in an environment of hardship despite everything they do. Promises of hard work and preparation leading to success in life vanish in these streets. and snowbanks heaped on their boughs. Everyone Rides the Bus in a City of Losers is a poetic tour of the underside of Montreal. There are no botanic gardens on this tour or Museums of Fine Arts or Parc Jean Drapeau. This is the real Montreal that most do not see but like any big city, it is always there but rarely talked about.